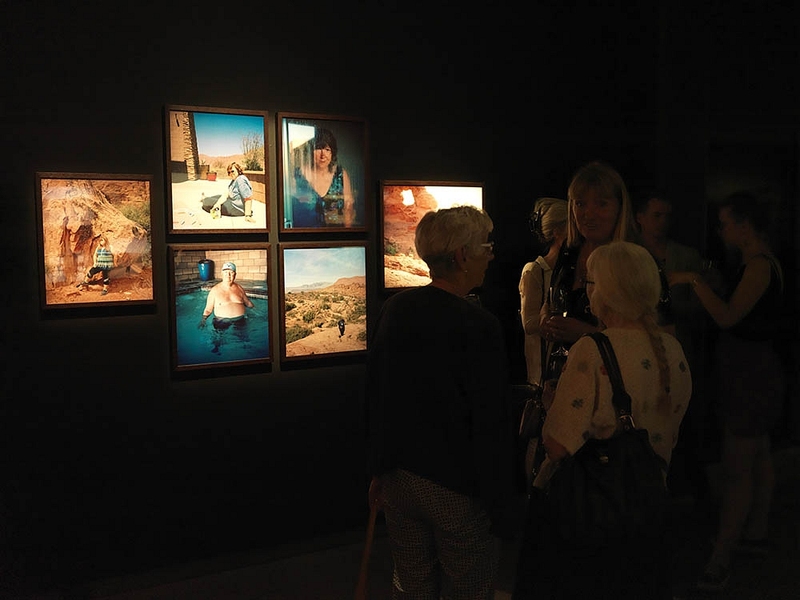 Last week my new exhibition 'A New Me' opened at one of the best photography museums in Northern Europe; Fotografiska, The Swedish Museum of Photography. Marie Hald, the 2018 Young Nordic Photographer of the Year has, with respect and artistic flair, captured their battle to lose weight. The exhibition A New Me is a story about people who have all been diagnosed by their doctor as being morbidly obese. A story about the struggle for survival. She has a special eye for exposing human vulnerability, without exploiting or diminishing the person being portrayed. 30-year-old documentary photographer Marie Hald from Denmark is Young Nordic Photographer of the Year 2018. "It was among other things, Marie's unique imagery with its melancholic and calm expression that caught the attention of the jury. In a close and personal way, she explores social problems and the impact of society on us in general, and women in particular”. The winner of this prestigious scholarship receives SEK 100,000, a mentor appointed by Fotografiska and a solo exhibition. Marie Hald’s A New Me opens on June 1 and runs until September 2, and as a mentor she has the extremely respected photojournalist Paul Hansen. – Marie Hald is so skilled that I consider it an honour, and the fact is I see her as a rewarding interlocutor, rather than it being a classic mentorship, says Paul Hansen. Marie Hald, who in 2013 was a World Press winner and also won the Picture of the Year prize in Denmark, often focuses on the intense situations in life, when something is brought to a head. These are moments that occur in everyday life, which Hald manages to capture with both tenderness and sensitivity. This could relate to a body or a context. In her solo exhibition A New Me, she follows life in a so-called fat camp in Utah in the USA, where in a landscape of shimmering pink rock formations people are struggling to lose weight. They all have a story that explains the reason for their considerable weight gain, and their motivation to now reverse this trend. – In previous projects I have closely followed the lives of young people with anorexia and bulimia, and recently I have researched the new wave of activists who are fighting for the right to be fat. For a long time, I have had the desire to explore another side of the story of fat people. The nameless, those that are big and would like to lose weight. It became the exhibition A New Me , a study of the phenomenon of weight loss camps, which are especially popular in the United States, a country where much of the population is overweight, explains Marie Hald. In the United States there is a whole industry for weight loss in the form of slimming products, weight loss-cookbooks, and slimming clothing etc. But it is special weight loss camps, which became well known through the TV series "The Biggest Loser", which Hald has found interesting to study and describe. Hald travelled to the state of Utah in Western USA, which is known for being a kind of health hub. This is mainly due to the large group of Mormons living in the state, who have a strong focus on health. The camp she visited, Movara Fitness Resort, has also previously been part of the Biggest Loser concept. Here she shared and followed the everyday lives of a group of women and men who checked in to start a process of weight loss. Common to all of them is that they have been diagnosed by their doctors as being morbidly obese. – With my photographs I want to get close to the different people who live at the camp, and who are struggling to lose weight. All the people I have met have a dramatic story, and there is always a reason why they have become very fat. This may be due to a life crisis - divorce or death, as well as diseases that make it difficult to maintain a low weight. I think it is important to tell these stories - especially because fat people often face many preconceptions of why they have become fat, such as they are lazy and unintelligent etc. During this project, for example, I have met lawyers, dentists and social workers who have taken themselves to a weight loss camp in order to gain control of their body. Hald describes the driving forces behind A New Me as being connected with her previous projects, which focus on the human body and our different approaches to it. In The Girl From Malawa she portrayed girls with anorexia, who are obsessively driven to achieve their definition of perfection. In Fat Front, it was about so-called fat activists in the emerging movement of fat people fighting for the right to be happy with their bodies and to make society accept this. – Now it was time to focus on those who were extremely overweight and wanted to lose weight. The aim was to emphasise their personal stories so that you will not just see a fat body and be prejudiced about it. It is always a challenge to photograph personal stories like these. I know that many people find it an intrusion and cherish their "personal space". So I have to be incredibly sensitive and make sure I do not overstep too many boundaries. It is a balance, where I try to push the boundaries and go a little further than what in the beginning people are happy with. But not so far that they regret they opened up to me. Hald is often asked how she is able to get so close to the people she is following. – I meet people with openness, sincerity, curiosity and considerable motivation to create a poetic story. They can see that I am sincere and passionate about what I do - and therefore they want to help me. The technique I use is analogue. It contributes to a more sedate process and prevents those I photograph being able to immediately see the picture in the camera, which is a stress factor when working digitally. Analogue photography provides much needed calmness.